Here's a fun game: I'm going to list some ingredients, and you tell me if they would make a recipe for a great sportscar if they were mixed together. Revolutionary styling by an Italian legend? A potent turbocharged engine? Suspension tuning by Lotus? Japanese robustness? Bringing all of those things together sounds like a fantastic idea. So why don't more people remember the Isuzu Piazza, also known as the Isuzu Impulse? Before they pulled out of the U.S. market in 2009, Isuzu was probably best known here for building trucks and SUVs, often in collusion with General Motors, as well as commercial vehicles. But Japan's smallest car company made some incredibly interesting passenger vehicles as well, and the Impulse was one of their coolest efforts. Our story starts in the late 1970s. Isuzu needed a replacement for their 117 Coupe, which debuted in 1968 and would stick around until 1981. While the sleek, Alfa Romeo-esque 117 is quite attractive, it was looking pretty dated as the 80s approached. 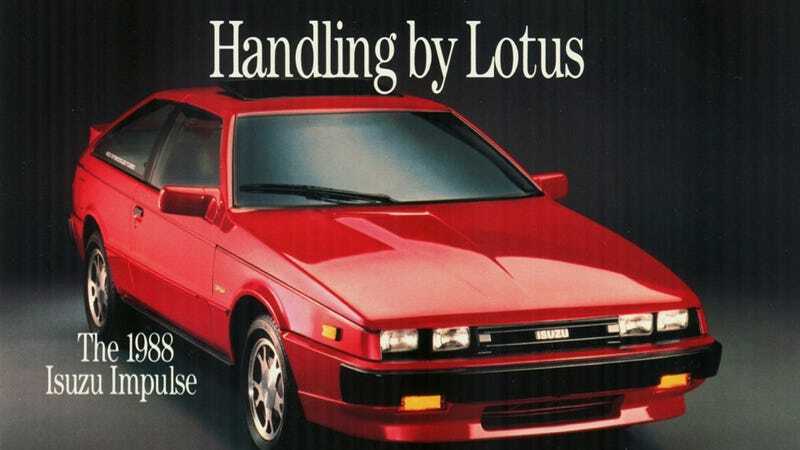 So Isuzu approached the man they commissioned to design the 117: Giorgetto Giugiaro, the Italian behind greats like the Lotus Esprit, the Ferrari 250 GT, the original Volkswagen Golf, and many others. As could be expected, Giugiaro didn't disappoint. His concept, called the "Ace of Clubs," debuted to overwhelming enthusiasm at the 1979 Tokyo Motor Show. The wedge-shaped design, pictured above, was angular and sleek at the same time, very sporty, and thoroughly modern. I like what Car Lust wrote about it a few years ago: "On streets populated with Impalas, Fairmonts, and Gran Furys, the Impulse looked like a rocket ship." Isuzu knew they had a hit on their hands, so they fast-tracked the coupe into production with few changes from the concept design. It debuted in Japan in 1980 where it was called the Piazza, a salute to its Italian father. But as flashy as the design was, its rode on a modified version of the rear-wheel-drive GM T-Body platform — the same one that underpinned the Chevrolet Chevette. The car went onsale in the U.S. as the Impulse in 1983. Engines included two 2.0-liter four cylinder mills, one SOHC and one DOHC, producing 120 or 135 horsepower respectively. Those were healthy numbers in its day, enough to keep up with competitors like the Toyota Celica. A new turbo 2.0-liter four was added in 1985 that bumped power to 140 horsepower and 166 lb-ft. of torque, according to Isuzu Performance. So the Impulse sounds pretty awesome. What happened to it? Why isn't it more fondly remembered? As Autopolis tells it, it kind of lost favor in the sporty coupe market to some of its front-wheel-drive competition, as that was the emerging trend in the late 80s. Isuzu also had a small dealer network and a small advertising budget, which made it hard to compete with the Nissans and Toyotas of the world. In 1990, a new Impulse was born, but this one rode on a front-wheel-drive platform with available AWD. That Impulse was essentially the same car as the Geo Storm in the U.S. It wasn't a bad-looking car, but it lacked the authenticity of the Giugiaro original. Sales weren't terribly strong, and production only lasted about three years. Isuzu would stop making passenger cars to focus on SUVs and trucks not long after. It's kind of sad that the Impulse/Piazza isn't all that well-remembered outside of Japan. It was certainly ahead of its time in the styling department, and it was a competent performer in its day. In the U.S. today, they remain extremely rare, so if you see one on the road, take some time to savor it. What's your favorite old-school Isuzu? And keep the suggestions for Forgotten Cars coming! Thanks for the suggestion xxstich666xx!